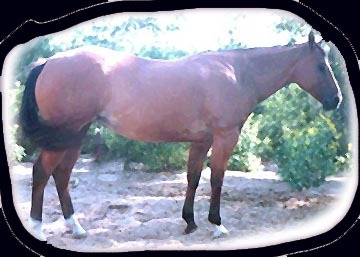 This is a nice foundation bred mare. Her daddy is a full brother to Coosa's momma. She helped raise both my kids. 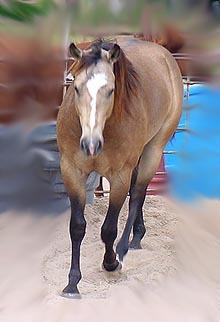 An excellent trail horse. She has been shown in 4-H and in MYRA playdays. She has also been used on trail rides, will go any where you ask her. She is very easy to handle and no bad habits. Very good push button control. Loves to be scratched and loved on. 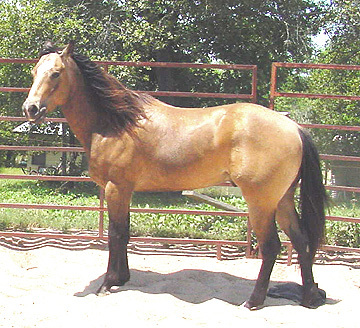 She was bred for the first time in 1999 and produced this gorgeous buckskin stud colt with a super laid back sweet personality, just like her. Awsome!!! Shimmers like metalic bronze in the sun. Smooth mover...fast learner. Bows down, gives hugs and kisses. Very sweet , friendly, loveable and laid back. Stands for hoof trimming with out being tied or held. Trailer loads. Stops and backs on loose rein. Pivots on forehand and haunches. Sidepasses both directions, etc. Transitions beautifully and softly up and down. Excellent ground manners. Murphy has a very sweet personality. When you ask him for a kiss he will put his nose in your face and give you one. When you stand at his side, ask for a hug, and reach your arms out to him he will turn his head, lower it, and put it in your arms. He is very loveable and will follow you around like a puppy. He does respect your space though and is not spoiled. He will also bow down. He has had a lot of groundwork ala John Lyons style so his ground manners are impeccable. When you walk forward, he will walk forward, when you stop and back up he will back up. 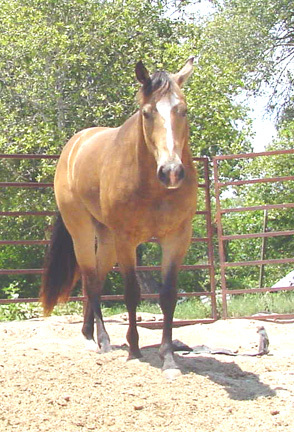 When you step toward his hip he moves his hip over or walk towards his head he will pivot on his hindquarters. It's like dancing. You don't have to push him around to get him to move over. 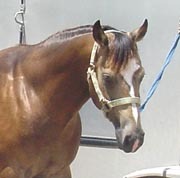 He was broke to saddle as a two year old using John Lyons techniques and was taught to give to the bit, put his head down, turn, back, side pass, pivot on fore or hind etc. He knows walk, trot, and lope cues. 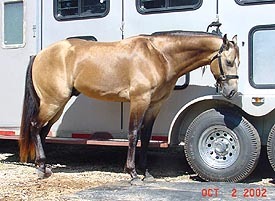 Stops on a loose rein with just seat cues. Backs with seat and foot cues. So far he has only had about 90 days of riding in a two year period. He knows a lot of things but would need more miles and training to get him consistent. I have been riding him more here lately working on picking up the correct lead, slowing and relaxing at lope, turning around cones, doing circles, keeping head down etc. He is also good out on the trail, up and down dry creek bank, over fallen logs, etc. He has never been shown but I have hauled him to several different arenas to ride in. Thank you and congratulations to Bruce and Jodie of Amarillo, TX on their purchase of this mighty awsome fella. We wish you the best of luck with him in everything you do. We know he will be well loved and cared for.